Synopsis: From the author of I AM NOT A SERIAL KILLER...John Wayne Cleaver has always known he has a dark side but he’s fought hard to oppress it and live a normal life – separating John from Mr Monster to survive. But after confronting and destroying the vicious killer that was terrorizing his town, his inner monster is getting stronger and harder to contain.And now more bodies are being discovered...With the police failing to catch Clayton County’s second serial killer John is going to have to use his secret knowledge of the first demon-killer to trap the second...but will he be able to avoid suspicion falling on him, and, in the face of extreme horrors, will he be able to restrain Mr Monster? I’ve never really been a fan of horror stories; pointless killing and torture never thrilled me. It seemed like such a feeble excuse to right a book or shoot a film. In fact, I was quite against it, especially the books which were aimed at younger audiences (10-13ish). That was, until I received Mr Monster. Having never really enjoyed the horror genre, I was a bit wary when my review copy came through the door. I read the blurb and the letter from the publishers, and I was intrigued by the concept of a guy murdering to stop other killers. I was also interested in how Dan Wells portrays the internal conflict of John Cleaver- the protagonist, so to speak. I’m glad a picked it up, though. It has probably been one of the most tense and thrilling books I have read in a while. It’s a shame I never heard about the previous book I Am Not a Serial Killer. 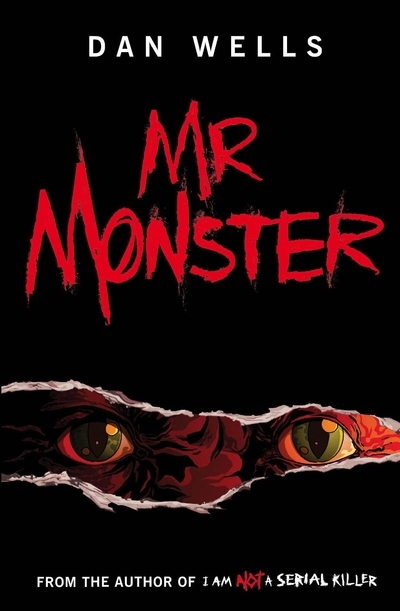 What I really enjoyed about Mr Monster is the tensions within himself- the lust for control, and his will not to want to hurt people. They are both very powerful and contrasting feelings, and it’s great how Dan Wells has managed to combine them together so well. They make John’s character infinitely more thrilling, deep and odd. John is such an amazing character to read about- highly unpredictable and disturbing, and yet I felt a strong bond to him from the very beginning, and a sympathised with him. He truly is an amazing character, the likeness of which I have not seen many of. The story is just as good. The climax is fast paced, tense and highly exhilarating. I had no idea what was going to happen, due to the spontaneous nature of John Cleaver… The complexity of the plot kept me gripped until the end, and it’s nice to read something fresh and down to earth after a line of strong fantasy novels. Dan Wells’ writing style is perfect for this genre; witty at times, it has a nice flow to it, and Wells manages to portray the action wonderfully. The descriptions are vivid and easy to imagine… While reading it I could visualise every detail. 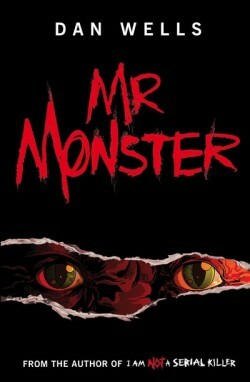 No doubt, Mr Monster would make a great film, too! It’s disturbing. Gruesome. Gory. And yet, it is also strangely thrilling and extremely entertaining. I read it in one go- interrupted only by the need for sleep…and I love it, and I’m pretty sure that plenty others will too. I will certainly recommend this to my friends, and I can see it becoming popular… This will be a book that will be enjoyed by many otherwise non-reading boys, no doubt.